In this post, BPC's archivist, Anne Kumer, shares some history. This post also appears on NYC Circa, a history blog about New York City and its public spaces. 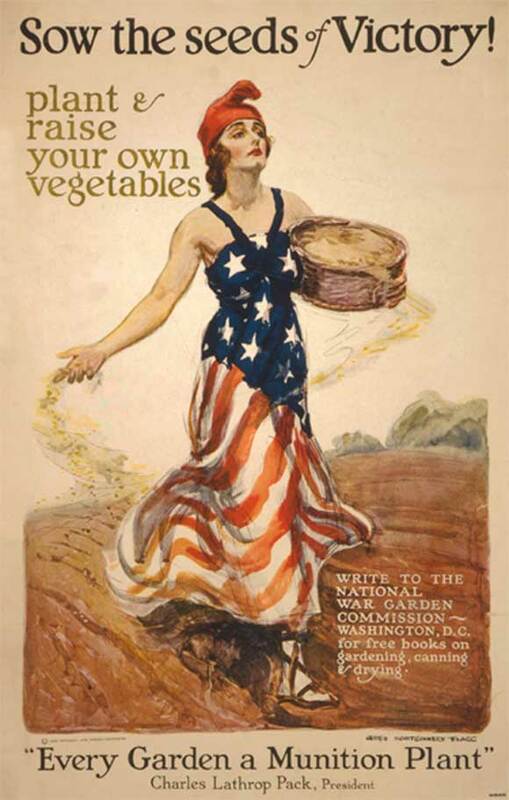 By 1917, World War I support efforts were creating significant strains on domestic food production. Food prices increased 200%, and people were hoarding what limited staples they could acquire. 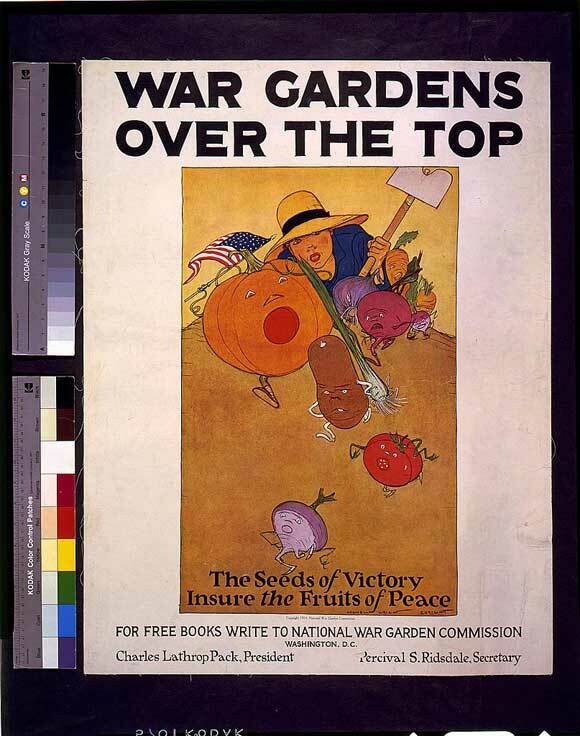 In March 1917, the National War Garden Commission was founded by Charles Lathrop Pack. The Commission embarked on a massive advertising campaign, encouraging citizens to get more involved in food production, and utilize public spaces, fire escapes, and rooftops to grow their own produce. Most of the posters employed the use of clever slogans, while trying to serve as morale boosters during a devastating time in history. In some ways, advertising hasn't changed much. Pretty ladies in pretty dresses are often used to sell all types of things, even gardening and patriotism. My favorite, screaming (banshee) produce. In New York City, on February 21, 1917, just a month before the National War Garden Commission was formed, 150 housewives stormed city hall, demanding involvement from local government. 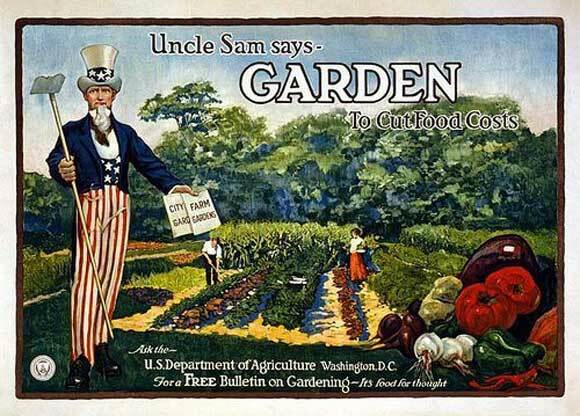 The Mayor at the time, John P. Mitchel, responded by creating a food committee to regulate prices and educate the public on urban gardening practices. The War Garden Committee of Manhattan was a branch of the Department of Parks and Recreation, and overseen by Park Commissioner William F. Grell. 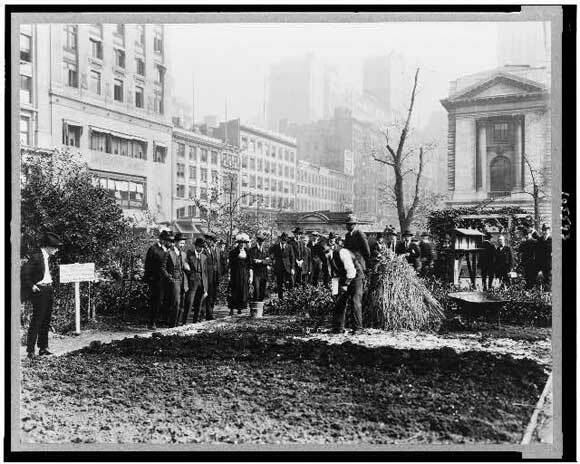 Bryant Park was home to one of New York's largest demonstration gardens. It opened on April 13, 1918, 93 years ago today, and was located on the north side of the park, about where the ping pong tables and Reading Room are now, and near the Eagle Hut. 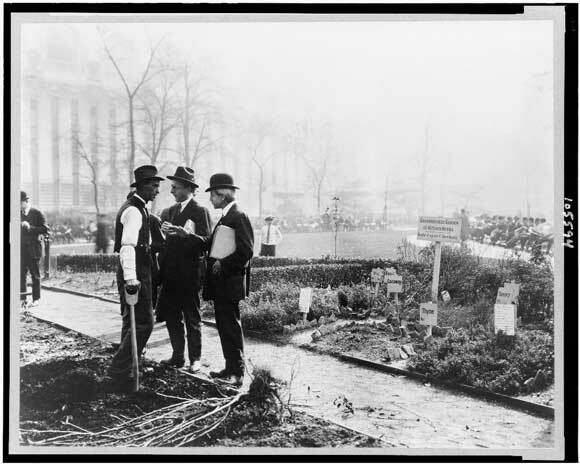 This garden, along with a similar demonstration garden in Union Square, increased Manhattan's gardening activities by 70 percent. Here, people could be more involved in local gardening efforts, receive instruction on how and what to plant, and interact with like-minded neighbors. 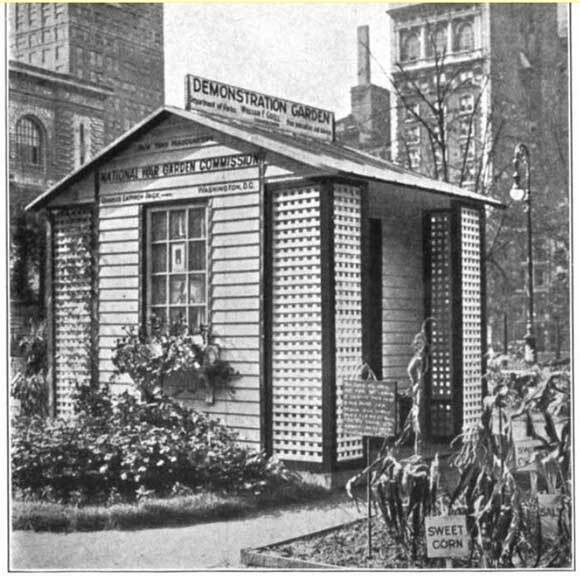 This small garden house was used as a depot for instructional literature, and as a sort of visitor's center in the park. Thankfully, the practice of urban gardening is still alive and well in NYC, with several farmer's markets in all five boroughs, and Community Supported Agriculture (CSA) programs all over. Click here to search for a CSA by zip code. Or, if you want to plant your own, GrowNYC has several open source publications on starting and maintaining your own urban garden.